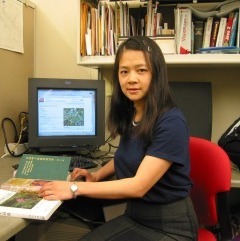 Xiangying Wen is Botanic Gardens Conservation International (BGCI:http://bgci.org)China Programme Officer since June 1st of 2007.BGCI China Projects Office is based at South China Botanical Garden,CAS. Xiangying Wen was also the first user of eFloras' online interactive key builder. She has built a few interactive keys at her own eFloras website. Her success encouraged many other people to use this tool. Recently, she has enabled South China Botanical Garden Checklist online. Xiangying also provided Chinese translations for the following keys. 9/1996–7/1999: Master of Science in Botany, South China Institute of Botany, Chinese Academy of Sciences. South China Botanical Garden Checklist online. Wen Xiangying,Lin Qi.2007. Validation of names of Leptodermis pilosa var. acanthoclada and L. pilosa var. spicatiformis(Rubiaceae).Acta.Phyto.Sin.45(3):410-412. Hai Ren, Weijun Shen, Hongfang Lu, Xiangying Wen, Shuguang Jian. 2007. Degraded Ecosystem and its Restoration in China. Landscape and Ecological Engineer. (online).. Gang Hao, Dianxiang Zhang, Lixiu Guo, Mingyong Zhang, Yunfei Deng and Xiangying Wen. A phylogenetic and biogeographic study of Cercis (Leguminosae). Acta Botanica Sinica, 2001, 43(12): 1275-1278. Xiangying Wen et al. Study on the leaf venation of five species in the family Schisandraceae from China. Life Science Research, 1999, 3(1): 69-74. Qi Lin, Xiangying Wen. Study on the geographical distribution of some important families and genera in the seed plants from Hunan Province. Journal of Hunan Forestry Technical College, 1997, 4: 38-45. Qi Lin, Xiangying Wen. Investigation of the resources about medical plants of the family Schisandraceae in Hunan. Hunan Journal of Traditional Chinese Medicine, 1997,13(3):61-62. Xiangying Wen. 2004. Xiangying Wen’s Interactive Keys.